A device that generates the energy of an ocean wave three times the average amplitude could provide a concentrated source of kinetic energy if successfully scaled. 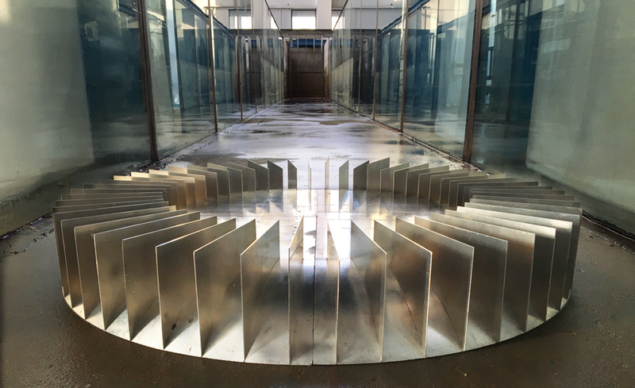 The device, unveiled as a ‘concentrator’ of wave energy by researchers in China and the US, focuses wave momentum in a small, shallow area without reflecting the energy back into a body of open water. As a result, the energy can then be harnessed as a power source. The international team of researchers behind the device includes Huanyang Chen of China’s Xiamen University and Zhenyu Wang of Zhejiang University. “Our ultimate goal is surely a real application near the seashore and to combine them to electricity engineering, and so on. But it needs more collaborations,” said Chen. By building a ring-shaped structure with a central open region from which 50 vertical metal sheets extend outwards, the design creates allows a shallow-water wave to pass through the sheets with minimum reflection, preserving the energy created. The sloped floor of the device meanwhile means water depth gradually decreases towards the centre. The device has been tested through multiple design calculations using simulations as well as physical demonstrations. Combining two waves of different wavelengths is shown to triple the total amplitude. The team plans to use the concentrator as a prototype for harvesting economically viable ocean-wave energy. A large-scale demonstration of the device is due to take place in the Chinese city of Xiamen, and the researchers say they expect wave energy could be added to solar, wind and hydroelectric energy in the renewables mix. Practical intelligence for water professionals. A quarterly magazine of the International Water Association (IWA), published by the IWA. For all advertising enquiries, please contact our advertising sales partner, CPL. The Source is received by all members of the IWA. The Authors are responsible for the choice and presentation of the facts contained in the articles and for the opinions expressed therein, which are not necessarily those of, or endorsed by the IWA and do not commit the organisation. The designations employed, the statements made and the presentation of material throughout this publication do not imply the expression of any opinion whatsoever, on the part of the IWA, or its Governing Board. Stay connected to The Source. Subscribe to stay connected to the latest developments in the water sector and receive exclusive content from The Source.